Despite the name, foot artillery batteries are towed by horses. The artillerymen, however, march alongside their pieces rather than ride. Because the guns can be loaded with round or canister shot they are effective at long and short range: canister shot turns cannons into gigantic fowling pieces. Artillery is slower than the rest of the army and, if left behind and undefended, will be vulnerable to cavalry attacks. Disabling the enemy’s guns should always be a high priority for a general, and artillerymen only have the most rudimentary sword skills for their defence. By the late eighteenth century, improvements in artillery design had drastically reduced the weight of cannons and their field carriages. Design improvements had reduced the time to get into action from the march. By carefully positioning the barrel in the centre of the gun carriage, the balance, and manoeuvrability of guns was significantly improved. Napoleon was an artilleryman, and his use of guns in concentration against small parts of the enemy battle line persuaded many nations to increase the size of their own artillery corps. 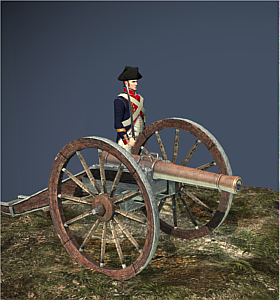 A great arsenal is a huge manufactory for artillery pieces and allows artillery units to be recruited.